Historic records reference a burial ground in the Farringdon area, opened during the Black Death of 1348. The limited written records suggest up to 50,000 individuals may have been buried in less than three years, in a hastily established cemetery. Despite significant development in the Farringdon area over the centuries, the burial ground, described in historic documentation as “no man’s land”, has never been located. 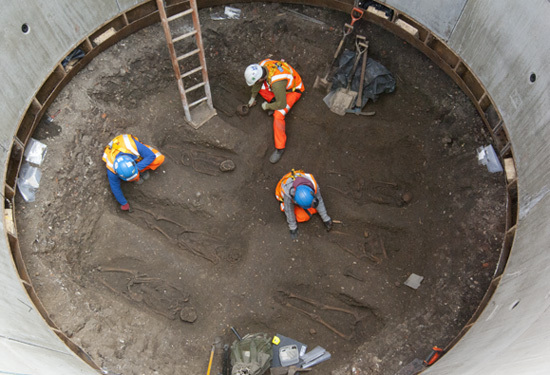 Several factors have led experts to conclude that the skeletons were buried in Charterhouse Square during the Black Death in around 1349, including the depth of the burials, the pottery found in the graves, which dates to pre 1350 and the layout of the skeletons. The graves have been arranged in a similar way to skeletons discovered by MOLA archaeologists in a Black burial site in East Smithfields in the 1980s. The skeletons are being carefully excavated and taken to MOLA for further testing. Experts hope to map the DNA signature of the Plague bacteria and possibly contribute to the discussion regarding the cause of the Black Death.